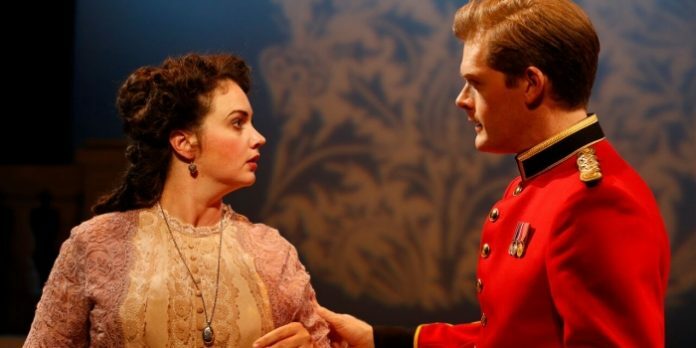 Emma Slipp and Martin Happer in the Blackbird Theatre production of The Rivals. Photo by Tim Matheson. It is perhaps a bit ironic that Vancouver’s Blackbird Theatre boasts of something different from the typical shows seen this time of year. For while its current production of The Rivals may not have anything to do with Christmas, it is just as frivolous and light as anything else on stage during the holiday season. The Rivals is merely a trifle that, despite what we may have been led to believe, really is more akin to what we see on stage this time of the year. Irish playwright Richard Brinsley Sheridan’s first play, written in 1775, The Rivals just may have you thinking of it as a precursor to the modern sitcom. The big difference here, of course, is that while the typical television situation comedy runs a mere 22 minutes, Sheridan’s comedy becomes a rather bloated 160 minutes with intermission. One should be thankful though, as Sheridan’s much maligned original script was considerably longer. The Rivals follows the adventures of the wealthy Captain Jack Absolute who woos his bride-to-be Lydia Languish by pretending to be a lowly ensign. Seems Lydia is a bit of a rebel, looking to marry beneath herself, with romantic ideals absorbed no doubt by the many racy novels that she reads. Meanwhile, their friends Faulkland and Julia have their own romantic predicament, as the insecure Faulkland is unconvinced of his lover’s romantic feelings, devising a number of tests to discover her true intentions towards him. Added to the mix is Lydia’s aunt, Mrs Malaprop, who refuses to allow her niece to marry the lowly ensign without, of course, realizing that he is in fact Captain Jack. The vocabulary killing Malaprop is assisted by Jack’s disagreeable father, played with appropriate authority by Duncan Fraser, who believes his son worthy of Lydia. Of course, no one is aware of Jack’s dual personality, which eventually puts himself into the ridiculous position of becoming his own rival for Lydia’s hand. 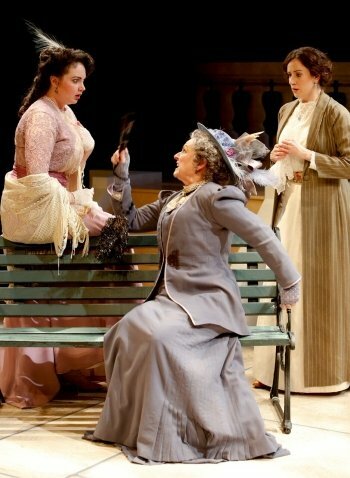 Gabrielle Rose (center) as malapropist Mrs Malaprop with Emma Slipp (left) and Luisa Jojic. Photo by Tim Matheson. Rounding out the cast of characters, and adding to the show’s runtime, are the buffoonish Bob Acres (Kirk Smith) and Sir Lucius O’Trigger (Scott Bellis). While Smith and Bellis do nice jobs with these two, both seem to be here more for comedic value than any real plot advancement. The final characters in this production are the long-suffering servants to Lydia and Acres, played with a wonderful level of mischievousness by Jenny Wasko-Paterson. As Captain Jack, Martin Happer is suitably wily and is paired well against Emma Slipp’s over-dramatic turn as Lydia. John Emmet Tracey is appropriately milquetoast as the doubting Faulkland, and Luisa Jojic perfectly captures Julia’s bewilderment. Under Johnna Wright’s direction, the real star of this show is Gabrielle Rose. As Mrs Malaprop, she seems to be in her element here. A “suppository” of the malapropism, throwing out bits of her literary namesake at every opportunity, Rose is almost self-aware. The result gives the ridiculousness of her dialogue a wink-and-nod that goes well beyond Sheridan’s penchant for breaking down the fourth wall. David Roberts set works with the turntable that reveals Lydia’s first appearance a visual delight. Surprisingly it is a bit drab though given the lighthearted content, but it does allow some of Sheila White’s costumes to pop. 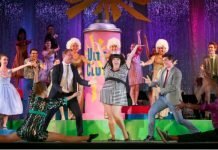 In the end, Sheridan’s lengthy comedy of manners cannot compete with the level of sophistication from some of Blackbird Theatre’s previous undertakings. The Rivals is merely a trifle that, despite what we may have been led to believe, really is more akin to what we see on stage this time of the year; as Blackbird Theatre’s tenth anniversary production it is a bit underwhelming. (This review was edited on Jan 5, 2016 to correct a grammatical error). The Rivals by Richard Brinsley Sheridan. Directed by Johnna Wright. A Blackbird Theatre Company production. On stage at The Cultch’s Historic Theatre until January 23. Visit http://blackbirdtheatre.ca for tickets and information.